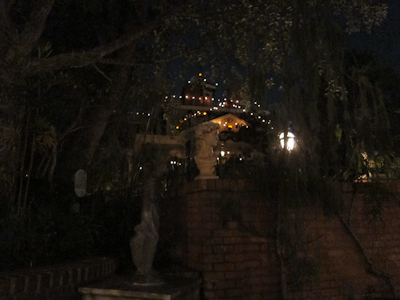 Well, yeah, My Year With The Mouse missed the Haunted Mansion Holiday. And you’d think I’d have little excuse because that goes up for Halloween and stays through Christmas, but it’s also a popular attraction, and the time I went on it this year I was with a friend and therefore enjoying the moment rather than documenting it for posterity. And really, MYWTM has never been much for posterity. 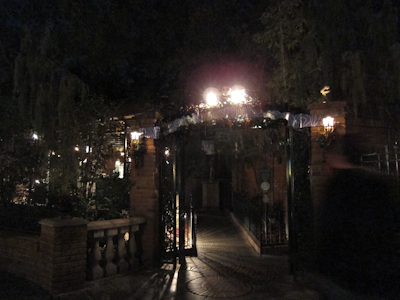 Anyway, so we headed back to the park for our last week of Holiday decorations post-holiday post-blockout, and I thought hey, I’ll just ride Haunted Mansion Holiday by myself because Theo will likely be too freaked to go on it. So I separated from my pack and went over. Yeah, um, it was crowded. And they did have the Fastpass open, but the return time was after the expiration of our *cough cough* Downtown Disney parking ticket. So, I took pictures of the Fastpass. Now first let me say that the HM only uses Fastpass for HM Holiday. And it’s pretty darned cool. Oh, also? The lighting was awesome. HMH is by far the best themed Fastpass distribution. By the way, Fastpass is the system where instead of just waiting in line for a ride, you enter you park ticket and get a timed ticket and when your time is up, you go through a shorter line. It's even cooler at night. When these pictures were taken. 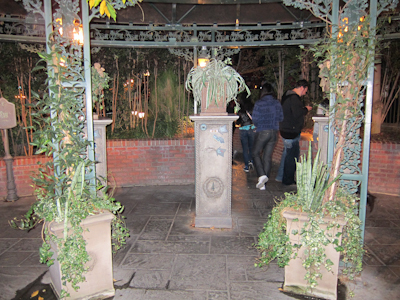 Now many of the Fastpass areas do have some generalized theming, the Haunted Mansion Holiday has quite meticulous theming. I AM AN AWESOME PHOTOGRAPHER! 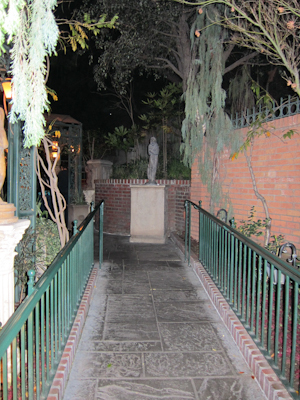 The little statue garden sits off to the side of the Haunted Mansion itself, and if I were a decent photographer you’d see how lovely it is. Unfortunately, you’re stuck with me. 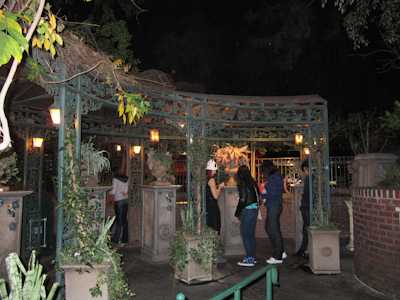 And that, in a nutshell, is the Haunted Mansion Holiday Fastpass distribution area. Honestly, it’s worth taking a peek back there anyway, just because it’s so cool.